Feeders are an important part of material handling systems. They control the flow of the materials, helping to expedite and control operations in a variety of industries. One question that comes up frequently is whether it is better to use an apron feeder or a vibrating feeder. There are the pros and cons to each type of feeder, and often the best option will depend on how the feeder is to be used. Apron feeders are well suited for applications where large tonnages of material will be moved, and are also ideal for situations where severe impact loading is expected. These feeders are also ideal when rough or abrasive materials are being processed, such as commonly is the case with ore and rock. Using an apron feeder provides a steady feed, as well as a sturdy one. These feeders are perhaps the most durable in the business, and are also versatile enough to work with materials that are wet, frozen, clayish or sticky. Excellent feed control with a variety of materials and long-term reliability make apron feeders so popular in many mining operations. Vibrating or vibratory feeders are able to accommodate a wide variety of materials and particle sizes. These feeders are well suited for use with both heavy and abrasive materials, and are a good option for sorting a variety of different materials. This is commonly the case with gravel and stone-crushing operations, where different sized stones may need to be handled and processed differently. Vibrating feeders may not be ideal for materials that are very fine, however. Materials that are sticky also may not work well with vibratory feeders as the material may build up in the pan. Rackers Equipment Company has been meeting the needs of customers in the construction and aggregate industries for more than 30 years. 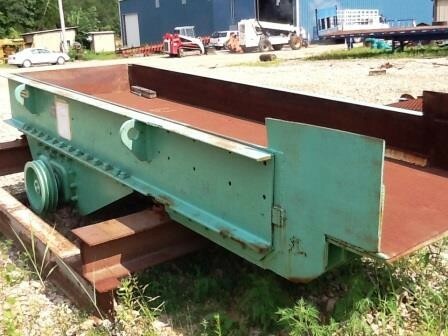 We sell a variety of used equipment, including apron and vibrating feeders, in addition to new equipment. Please browse our complete inventory of feeder equipment online now or call us today at 573-635-8700 to discuss your equipment needs. Our goal is to provide the equipment and services that your company needs to succeed, and we can work with you to find the parts or equipment you’re looking for. Contact us today and let us help with your next job.